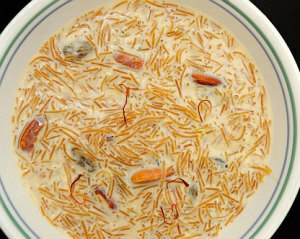 Sheer Korma: Sheer Korma or Sheer Khorma or Sheer Khurma is a festival vermicelli pudding prepared by Muslims on Eid ul-Fitr in India, Pakistan, and Bangladesh. It is a traditional Muslim festive breakfast, and a dessert for celebrations. Sheer Korma is a special dish, served on the morning of Eid day in the family after the Eid prayer as breakfast, and throughout the day to all the visiting guests. It is very popular throughout South Asia and Central Asia. Melt 1 tablespoon ghee in a pan. Roast the vermicelli till they are golden coloured. In the same pan, melt the remaining ghee. Add in the chopped dry fruits. Sauté the chopped dry fruits, stirring often, for 3-4 minute. Heat the milk in a heavy bottomed saucepan, on medium heat. Add in the chopped dates and golden raisins. Lower the flame and simmer for 8-10 minutes till the milk slightly thickens. Add in the roasted vermicelli and sugar to the milk. Simmer the mixture till the vermicelli are cooked and have become soft, takes about 8-10 minutes on a low flame. Add in the roasted dry fruit mixture and green cardamom powder. Remove the sheer korma from heat. Stirring continuously, add in the rose water. Taste the sheer korma and add more sugar if required. Sheer korma is ready to be served. Serve the sheer korma hot, warm or chilled. If you have any queries regarding the Sheer Korma recipe, please leave a comment.